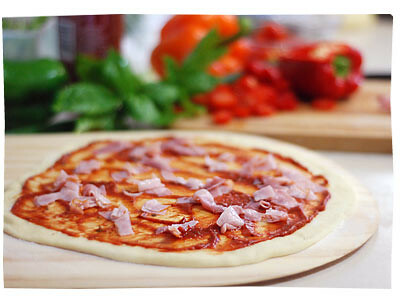 Whenever I make my own pizzas, I have always used bought, pre-made pizza bases or used wholemeal pita breads. But after I learned how to make a professional pizza, I’ve decided it was so easy to make my own bases, that I was converted. 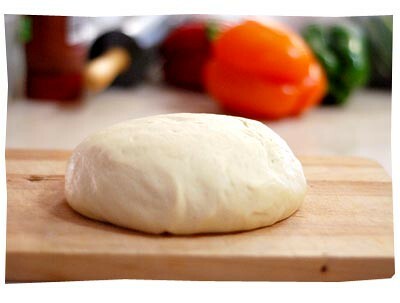 This is a nice simple pizza dough recipe I found and modified. 1. Mix the warm water, yeast, sugar and salt into a bowl. Stir well with a fork. Cover with plastic wrap and set aside for 5 minutes, preferably in a warm place. 2. Sift flour into the same bowl. Add oil and mix well with a spoon to form a dough. Knead the dough on a floured surface for 7 – 10 or so minutes. 3. Place the ball of dough into an oiled bowl (if you’re lazy like me, just oil the same bowl). Cover with plastic wrap again and cover again with a tea towel. Put the bowl in a warm place and leave for 30 minutes. 4. Uncover the bowl, the ball off dough should be doubled in size. Give the dough a punch, and knead on a lightly floured surface. 5. Halve the ball of dough, and roll out to make 2 pizza bases. 6. Spread tomato paste on the base, making sure you leave a 1.5cm clean edge. 7. 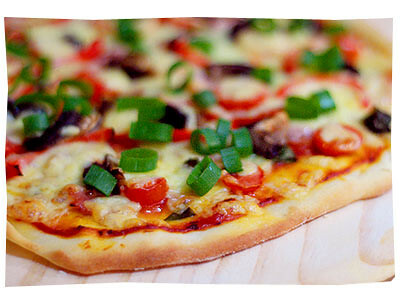 Cook in a 200°C oven for 10 – 15 minutes, until crust is golden brown. « Clothing Alterations are a MUST!